Shares of SIR have been on fire since mid-October, albeit in volatile fashion. Even with all the ups and downs, a clear upward trend is starting to develop (as we’ve annotated in blue), and we think that this name has more room to run if it can take out its last bearish stand, the key $0.28 resistance level. What does this all mean for the stock? Well, when a company announces an upside surprise of this nature, very few events can change the overall stock price trajectory, unless the fundamental picture deteriorates, something that simply hasn’t happened since that news hit in mid-October. With an upward technical trend line in place, the stock a whisker away from a key technical breakout level along with a positive fundamental backdrop, the path of least resistance appears to be to the upside. Looking forward, as mentioned already, we would look for the $0.28 to be key in further upside movement. If the stock can’t break this level, we wouldn’t even entertain this stock as a potential trade idea. If we do get this technical breakout, further resistance appears to be around $0.34 followed by more at $0.40, $0.48 and the mid-October high of $0.60. For this trade, we think a break above the $0.28 resistance could excite the bulls enough to have the stock pop to at least the $0.40 resistance, which is why we would have a price target right at $0.40. As for support, we would watch the roughly two-month old upward trend line as the first line of defence, currently at $0.26 and rising. Below that, support is likely around $0.25 and $0.22. Because of the dynamic and static support cluster around $0.25 - $0.26, we would not want to see shares drop below those dual support levels thus setting a stop loss at $0.24. As mentioned off the top, the key to this trade is a successful technical breakout of the $0.28 resistance level before we would want to leap into this trade. 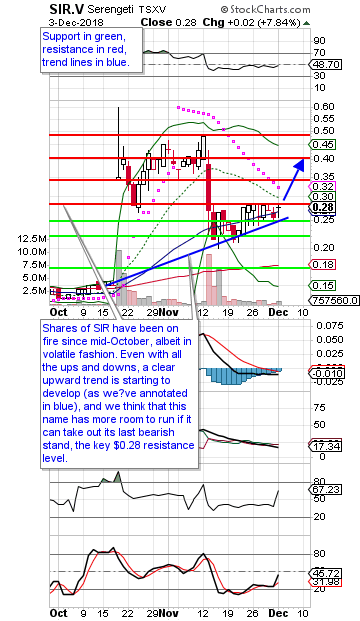 As such, we would only enter the stock upon a close above $0.285, specifically on strong volume. Based on a $0.285 entry level, our upside potential looks to be 40.4% while our downside risk is limited to 15.8% for a strong upside potential to downside risk ratio on this trade.